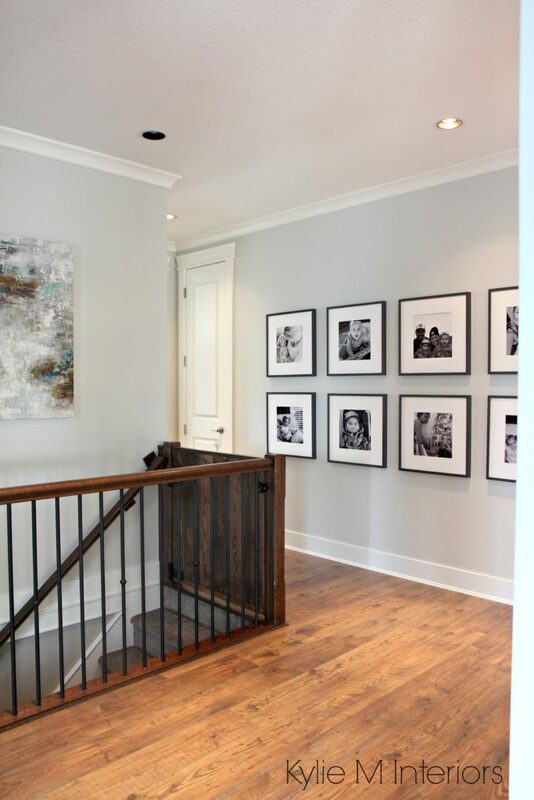 All About: Benjamin Moore Gray Owl – Undertones and More! Grays are rarely simple and Gray Owl is no exception. When my e-design clients ask for a gray the first question I have is, ‘What kind of gray are you looking for? Blue, green, purple, greige, clean, muddy…?’ and the minute they say that they like cooler toned grays I think of Gray Owl. Click on above photo to view my fun Online Consulting Packages! Still not sure if this is the gray colour for you? Check out my affordable Online Colour Consulting Services for your own personalized Colour Consultation! Kylie, love, love, love your designing and your blogs! Your blog this week brings up a subject that perhaps you could do a blog on for those of us who are color dumb: warm and cool tones. I have difficulty discerning one from the other and wonder if you would offer insight. Ooo, good idea Judy! I’m ALWAYS ALWAYS looking for new ideas for blog posts – so thank you~! Ohh..how I wish you had provided this info about 2 weeks ago. I painted my home office (which is very small and connected to my laundry room) Gray Owl. I was convinced it was the color for me until…I finished. It looked like a blue baby nursery! All I could determine was that the wall color from my laundry room (SW Interesting Aqua) was bouncing off my office walls. Total disaster on my part. I ended up painting my office BM Balboa Mist which I like a lot better. Whew! I would give anything I had also found your blog about 2 years ago! Thanks for all the great details on paint. It can be so complicated. Oh man! I’m sorry to hear that! However, thank you for sharing that info. No matter how many times I tell people about the undertone, they don’t always believe me so I’m glad that I’m not TOTALLY crazy (only a bit…) You’re the third person in about 3 weeks who has had an experience like this, which is why I decided to write a post – clearly Gray Owl is a tricky colour! And Balboa Mist, great choice! Collingwood Gray, the darker version of it is one of my fave soft grays so I bet it looks amazing! If you haven’t already, please consider subscribing to my blog (right hand of the blog page) – it’s free and I do quasi-weekly updates that are fun and informative! We are in the home stretch of our cottage renovation in Ontario. You did an online consultation for me this past winter and we have chatted once or twice since then. My painter has just finished our first coat of Gray Owl in the Master Bedroom. The painter commented that he saw a hint of green and I saw blue undertones, so indeed this colour can be a cammellion! But it looks totally fresh and is just what I wanted. I often check your posts for your great advice. I will send you some photos when we finish the Reno. Hi Glenda, good to hear from you again! I’m so glad you are enjoying Gray Owl and yes, it is a SUPER chameleon colour, isn’t it! I can’t WAIT to get those after photos! What is the Sherwin Williams equivalent to Gray Owl? Hi Leslie! Now SW doesn’t have an exact equilavent, but keep in mind that they do EXCELLENT colour matching, so if you were so inclined they could MAKE Gray Owl for you – in the SW brand! The closest would be Crushed Ice, but really, it doesn’t have that lovely blue/green undertone flashing through, so if it were me, I’d get a colour match done for sure. We painted our house gray owl and it look a little green in the kitchen at night. Do you have any suggestions on a coordinating gray for my lower cabinets (uppers are cloud cover)? I’m planning to paint my kitchen walls Gray Owl and my cabinets “off the shelf white” but would like to paint my island a color. I thought about painting it Gray Owl or even a darker color. What darker gray would complement Gray Owl or should I just paint the island Gray Owl too? My counter tops are quartz. (Carrera marble look) My backsplash is white subway tile. Did you ever give Kylie your thoughts on which darker gray would do well for the island. I’m putting a vertical ship lap style on a wall in a small beach house? Hi Greg, I usually refer colour questions that are personal to my Online Consulting, but do check out BM Chelsea Gray, it can be a great charcoal colour for cabinets! Hi Beth! With Gray Owl I often like a nice clean white, like SW High Reflective White. For a softer subtle look, BM White Dove is a beautiful choice. Hope that helps! I so enjoyed all your information and details on paint. I have been so depressed trying to pick out paint colors for the exterior of my home. I have bought so many samples and its so overwhelming. Can you please suggest how I should paint our home. I would like to send pics and see if you would give me some ideas. our home has so much going on and I just cant get it together. Please let me know how to send you pics. I would be so grateful for any input. Hi Melody, thank you for the note! I actually have designed my e-design exactly for readers like you – those who have questions about how to paint and decorate their home! I love gray owl! Used it on my old house… and everyday was thankful for my decision. My husband and I recently got transferred to the arctic, and sadly… no Benjamin Moore is available. Can you suggest a similar Dulux colour? Ooo, the Arctic – I did a consult in Nunavut once! So, a Dulux colour similar to Gray Owl would be…nothing. Dulux really has nothing that is close. All of the options are different enough, that they would simply give a different look. Now knowing that you’ll probably have more gray snowy days than sunny ones, you could look at a softer gray, something like Dulux Oyster Bay. This has a bit more green and feels a bit softer/less gray than Gray Owl, but it’s certainly a similar ‘idea’. You could also look at a colour in between The Plaza and Antique Sterling. The Plaza is too light, but Antique Sterling is too dark. I would think by lightening/darkening one or the other, you could get a look that is perhaps a bit less gray, but certainly similar to Gray Owl (likely The Plaza darkened by approx. 40%). All I need is a light cool silvery gray that can go with my warm white cabinets and not pull pink or purple. It’s been an uphill battle and I’ve learned a ton from your site so hopefully I can nail something down soon. Thanks for all the info! Your website and color assessments are amazing and SO helpful — thank you! You have become our go-to source for color selection. My husband and I are repainting our first floor. I love Gray Owl, but he thinks it is too green. He’s pushing for Edgecomb Gray but I’m not in love with it, as I think it’s too similar to the ivory paint we inherited in the house. We are considering Stonington Gray as well, but ideally I would like a color that is a wee pit softer like Gray Owl. Are there any others in that family to consider? Thank you!! I just finished painting my room SW Sea Salt and my next project is to paint my bathroom. I am looking for a nice light gray. Would Owl Gray be a good choice or do you think it will come out looking more green or blue because of the Sea salt?. I got a sample of the SW Repose Gray the other day but to me it has too much of a tan undertone than what I am aiming for? I plan to paint my back bedroom whatever gray I decide to go with for a nursery at some point as well. We just had our whole downstairs painted in gray owl and we love it. I had many sleepless nights trying to pick a color and your blog helped me so much. I can’t thank you enough. My husband thanks you too! Love your insight and knowledge of colors… Your website is one of the most helpful resources I have found to understand and compare colors, so thank you for all the time and effort you put into it! Some say the gray trend is coming to a close, do you think Gray Owl will be outdated in a few years or do you think this is a classic, timeless color? I’m thinking of doing Gray Owl at 50% or Horizon as a main house color but I’d rather stay ahead of the curve. Hi Christine, from the SOUNDS of it, it could work quite well! Of course without seeing photos I’m not sure, but it seems okay from what you’ve written! I am in a grey delimma… the house I lived in was painted the absolute perfect grey… it was light and calming yet always changing colors… I had taken a picture of the name of the paint the woman who lived their before me had painted it…. through my move, my phone died and I lost my pictures … I cannot for the life of me remember it. I know it was not Owl grey yet your description sounds so similar to it…. I had white baseboards and in high light it would reflect blue…. other times look like a pale grey but in low light in the evenings it reflected greens…. it was just the coolest color and I fear it is forever lost …. are their any other greys that reflect blue and green? Hi Kendal, check out BM Shoreline and SW Crushed Ice. Sometimes it’s MORE about the exposure/light coming in the windows (ie: trees/grass) than it is about the colour. I mean, that’s not necessarily the case with you, but it can shift things 🙂 YOu can also check out Moonshine, which does lean green, but I’ve seen it easily flash blue. I hope that helps! What do you think about Gray Owl on the walls and White Dove kitchen cabinets/doors and trim? Would white dove work well? thank you.